These apple slices rolled into roses are so elegant! In fact, these rose apple slices look like they were prepared by a professional chef. Guess what? No professional training required, and you can prepare them at home too. 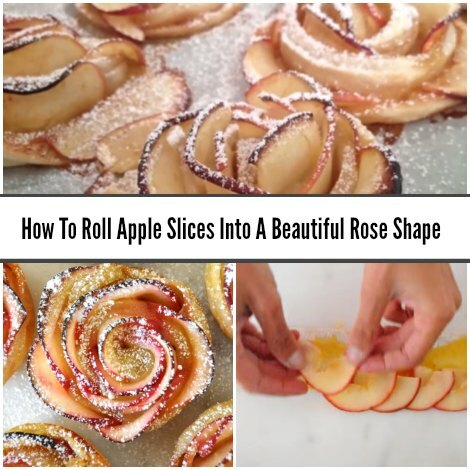 Rolling apple slices into beautiful roses is quick, easy, and everyone will think you’re an artistic food genius. The trick is to slice the apples really thin. Then layer the apple slice onto a rolled-out pastry puff with a little apricot preserve in between. Sprinkle the apples with a little cinnamon if you like, then gently roll up the pastry puff and apples and set each “flower” into a silicone muffin tin. Here’s the ingredients you’ll need to make six rose: 2 apples, juice from half a lemon, 3 tablespoons of apricot preserve, water, 1 sheet thawed of pastry puff, flour, cinnamon and sugar (optional). Pop into the oven and bake at 375 degrees from about 40 minutes. Serve these delicious and healthy rose apple slices a la carte or over vanilla ice cream. Your dinner guests will think you labored for hours in the kitchen, when in reality you spent about 15 minutes. These rose apple slices are a quick way to celebrate a special occasion too. Pop a candle into the center of the rose and light to celebrate someone’s birthday or recent victory.